Last week I published Ozura - A Responsive blogger theme. After Publishing Ozura, I got Nice response through mail from few readers about the post format(Thanks Guys) Among them one asked, "It'd be Awesome if we've a theme with similar post format with light color". So, The Theme I'm going to publish Today, On The sixth week of the BTNT Weekly Special!!! 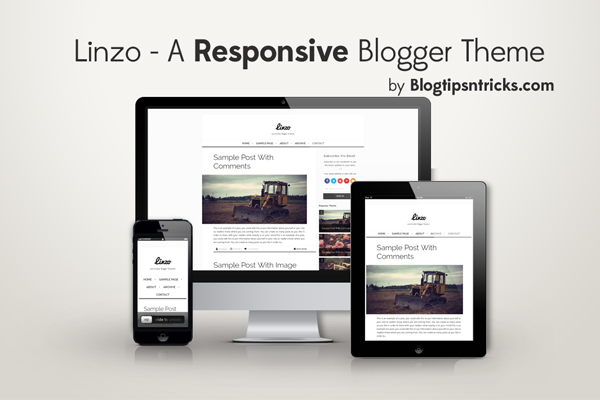 is Linzo - A Responsive blogger Template. According to his wish Linzo has similar post format like Ozura. Linzo is a 2 Column Box styled Minimal Theme with cool widgets like Custom Opt-In Subscribe Form, Custom Popular Post widget and Share Buttons on post pages, etc. Okay, Let's get to the Point. You can see a live demo of linzo below. 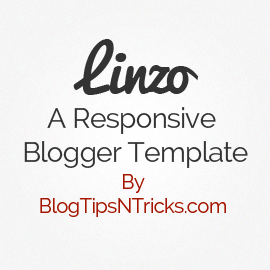 Click the Browse button and locate Linzo a Responsive blogger template. Thanks Bro, But I'm going to publish the widgets separately. BTW Nice cloning but Kindly don't share it. It is a very nice template. Can i give you an advice for the next? Create post zones managed by tags and one slide that shows posts from a tag. Thanks! You mean you want to have a magazine style template. Sure, will publish it in future. Next weeks template is already decided. It'll be focused for niche blogs. Thanks for you Opinion, but I think you haven't read the introduction of this article. I already mentioned it's designed like this according a reader's opinion. I won't customize and publish existing templates, Also even through it resembled like Ozura both have completely different layout and color palette. I design for readers and theme users. So, I've to give importance to their opinions. Of Course your opinions are also welcome. I always give importance to quality and uniqueness, but more than that I give importance to my readers. Good work Chandeep. I can see your hard work in this blogger template. Thanks for sharing this SEO friendly template with us. Hi chandeep nice work beautiful template. thank you for sharing templates. 1 New Google Universal Analytics code won't work with your tepmlates. 2.Post Description and Blog Description won't work as it use to. Very Very Nice Template CHANDEEP But can u make this template with footer ??? Sorry bro, I can't As this theme is already published I can't change the layout. I can only make back end development and bug fixing. but If you wish to add footer. Buy a license for this template. I'll add it for you. Can you please let me know if the below things are possible. This theme seems good and a bit different from the rest in the series. Well I do not want the the images in on the homepage. I mean in post preview. Also I want the logo on the left side. I wanna change the the post title and menu tab's font and font size. Also colors as well. I want it to be blue [ #179cd1 ] instead if your brown color. and yeah, can I have a drop-down menu option and a banner ad space on the top right side near by the logo? Yeah, It's possible but Sorry, I can only provide support for the theme. For customization you have to hire me, To know more details contact me through contact page. Sure, Kindly contact me through contact page with your blog address. I'm in love with this template. It's perfect, Chandeep! Sure, Added to the list, Will publish a template according to your wish in upcoming weeks. Love the template. I am having one issue however. The timestamp is not showing up on my posts. The sprite is there but the actual timestamp is missing. Any thoughts? Thanks a lot for this awesome theme! Could you pls tell me how do we add a custom page not found? Thanking for you as always...I've got 70 blogger blogs so far, and some of the templates coming from your end especially the new ones. I've changed my old blogs with the new responsive blogs. Again thank you so much. This is my favorite template and Ozura too. wow. very thanks you share for nice template. Just to drop you a line to say Thank You for the awesome template. Keep up the good work. Hello. Its a nice template ever but can you help me a little bit. I cant change my navigation menu !! Love this template but am so useless at HTML coding, I have no idea how to add info onto the navigation menu bar so the contact/archive info is there when clicked, can you help? Can I have the separate code for this templates Popular Posts widget? Hi ! I love this template! Is there any way to make it so that it isnt "read more" style?? I would LOVE that and use it for my blog Im building! I love you. The template works great! It says content is not allowed in prolog. I am using this theme on my blog.But it is showing only 5 posts in the main page.How to increase the number? Dear sir, i have try to download this template but i could not find the Main Menu to edit to link to my own menu. WIll you help me ?